Once you’ve decided to move forward with your plans to build a Katahdin Cedar Log Home, the process of getting your custom log home under contract, in our calendar, and confirmed with a money deposit is next. 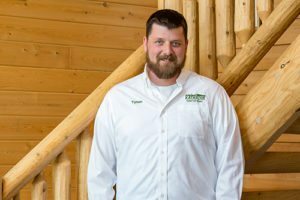 We spoke with Katahdin’s Tyson Weeks, Dealer and Sales Support Specialist, who works with new customers to get their Katahdin log home production started. Weeks is based in Oakfield, Me., at Katahdin’s headquarters, and will often be one of the first people you’ll speak with at the company. Your first call to Katahdin will likely be directed to one of Katahdin’s in-house sales representatives, Shannon Hersey or Stefanie McNally. 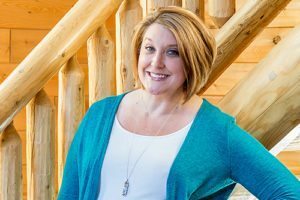 The sales rep will walk you through some of the basic steps to ensure you’re pre-qualified with land, a budget, and an idea of size and square footage you’re looking for in a custom log home. 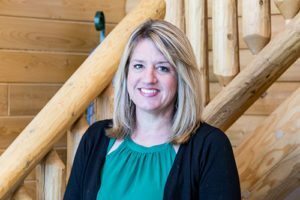 In what can sometimes be a reality check for some folks, the in-house sales team wants to make sure that first conversation helps each customer understand the scope and cost of their specific log home dreams. This initial phase of the customer contact generally is conducted over the phone and through email. “We may do 2-3 initial estimates, often using the Katahdin Challenge to help customers understand the quality of our complete package,” Weeks explained. Whether it’s one or multiple quotes, once the customer has a general design and figure they feel comfortable with, they will be referred to a Katahdin dealer in their general vicinity. Sometimes, Katahdin dealers are also builders; in other cases, dealers work with their own local network of experienced log home contractors. If there is no local dealer, their dedicated Katahdin sales representative will continue with the customer to moving forward. Preliminary sketches are often drawn up at the same time as developing estimates, as the two elements work together. Preliminary plans may come from a customer-drawn sketch or a modification of one of the 600-plus existing floor plans available on Katahdin’s website. Preliminary plans show the layout of your log home design, including the floor plan, loft plan and elevations, so you’ll be able to see what the cost estimate represents in size and configuration. “It’s not uncommon to have customers review a few preliminary sets before deciding on a final design,” said Weeks. When you’ve settled on a preliminary plan that meets your needs and wants, budget and your land, it’s time to save your place in the production schedule. Three elements will be needed to convert your sketch into an actual job in our production schedule when it’s time to move ahead with your Katahdin home. Your dealer will provide you with a complete, detailed contract that lists all the elements of your log home package and a copy of the preliminary plans that reflect what is described in the contract. Your signature on both the package contract and the preliminary plans along with your minimum 10% deposit payment will begin the official process of manufacturing your new Katahdin Cedar Log Home. Once your deposit is tendered, and your plans and package contract are signed, your home will be assigned a unique job number, and your complete plans will be scheduled for rendering in the design department. While schedules can vary based on the time of year, you can expect an average turnaround time of 4-6 weeks for completion of your package, which will be ready to ship to your location. You’ll be on your way to your dream Katahdin Cedar Log Home!